After lunch at the Druid, there was another riddle that would give clues to the location and the significance of the sites we would be visiting that afternoon. It didn’t take long for the company to divine that it had something to do with a hood in the greenwood, a giant’s ‘stride’, a stone circle and a hermit. A search of the books we had on the table…and a bit of Googling too… and we were on our way to Robin Hood’s Stride. The Stride itself is a fabulous outcrop that looks as if it would be more at home in the landscape of some fantasy film or the American west. It is another site we know well, as it is part of a much wider sacred landscape whose history begins in the Neolithic era and continues into medieval times. The area immediately around the Stride holds Bronze Age settlements and barrows, an Iron Age hillfort, a stone circle and a hermit’s cave… and through the middle of this landscape runs an ancient track, now known as the Portway. Mam Tor – the Shivering Mountain above Castleton. The Portway runs across the Derbyshire landscape, from Mam Tor… the ‘mother hill’ above Castleton to the Hemlock Stone, forty miles away in neighbouring Nottinghamshire. The old tales say that the Hemlock Stone was thrown to its current position by the Devil himself when he lost his temper at the constant ringing of church bells. This is obviously a later legend… the stone has probably been there since the Ice Age and the track was in constant use from prehistory to medieval times… but it does link both ends of the trackway. Like the Ridgeway, which is some five thousand years old or more and possibly Britain’s oldest road, the ancient track runs close to some important prehistoric sites along the way. From the village of Elton, it follows Dudwood Lane to pass between Robin Hood’s Stride and Cratcliffe Crag, or Tor, and beside the stone circle. ‘Dudwood’ may come from ‘dod-wood’ and Alfred Watkins, the author of the Old Straight Track and father of the modern interest in leys, posited that the ‘dod-men’ were the prehistoric surveyors who laid out the original network of trackways. 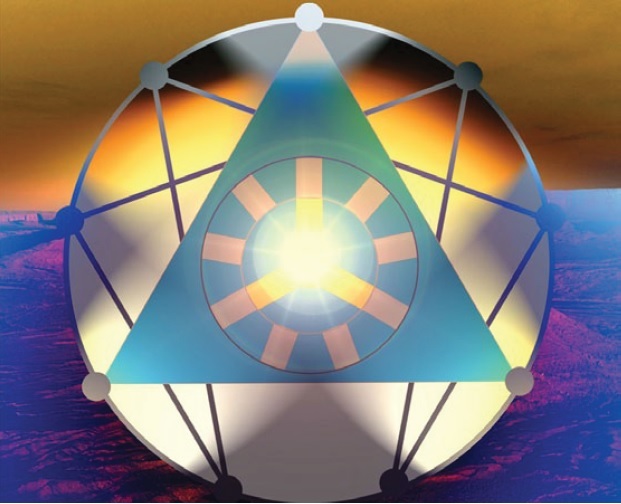 The existence of the ley network invites much controversy and many theories, with some believing that they are simply routes between significant sites, others that they map earth energies and yet others claiming they do not exist at all. Our purpose was not to impose a view, but to explore ideas and, considering where the breadcrumb trail had been leading us, to offer a few possibilities of our own… and this site provided us with an ideal location to explore some of them. But first, we needed to explore the land itself, starting with the Stride. Boulders of strange shapes and aspects litter the ground around the Stride. One looks like a giant hare, with its ears folded back moongazing. Others look like giant heads. There are traces of prehistoric rock art, hidden amid more modern graffiti, showing that the place was important to our more distant ancestors and the continuing tradition of climbing to a dangerous point, to hang there a wicker heart as a symbol of love, suggests a memory of old fertility rites. You could call it coincidence that a perfectly shaped nose forms one wall of the cave… a single stone, unattached to the main body of the Stride, that rests against it. We know that the ancients moved huge slabs of stone…we could see four that had been indisputably erected in antiquity from where we stood. We also know that if we, modern humans who are so far divorced from the life of the land, can see the faces and forms in the stone, be they natural, coincidental, fortuitous, or not, then our ancestors, whose survival required their attunement to the life of the land, would have seen, used and possibly adapted them too. Thank you for sharing, Patty.